The Red Star Lodge is a spacious mountain house about 8 miles from the Alpine town of Helen, Georgia. The Red Star Lodge is secluded but convenient, rustic but modern, spacious but cozy. The Red Star Lodge has paved access and no severely winding or steep roads. The Red Star Lodge is fully equipped with a large kitchen and dining area with seating for 10. The balcony loft master suite has a queen bed and a LCD TV. It's bath has a huge whirlpool tub and separate shower. The main floor master has a king bed and a wall mounted LCD TV. The lower level bedroom has two full beds. The great room has a floor to ceiling rock fireplace with gas logs and a 42' plasma TV. The lower level den has a rock fireplace with gas logs and a 42' plasma TV. The lower level also has a game area with several board games, dart board, ping pong table, air hockey table and Foosball table. This level has it's own kitchenette and dining area. The lower level deck also has the 6 person hot tub. Hi-speed Wi-Fi. Oktoberfest in Alpine Helen: Oktoberfest every fall. This German festival has been a Helen tradition for over 30 years and is the longest Octoberfest in the South. Visit the Helen CVB online at www.helenga.org for more details and a full event calendar. I'm a pharmacist in northeast Georgia. My wife Linda, a nurse, have been married for almost 30 years. We have 2 adult children, Tyler and Tanner. We have owned and managed this cabin since 2008. We also own and manage 3 villas on Hilton Head Island, SC. Each bathroom is spacious and each bathroom is supplied with thick 100% cotton towels, 10 sets total. Each of the showers have great water pressure and hot water from an 80 gallon tank. The water itself is from a well deep into the mountain, our own version of mountain springs water. Maybe we should bottle it! Great view of Yonah Mountain! Beautiful home! Perfect for family of 9 with everything we needed and more. This home was perfect for our party of 9, ages 7 to 75. We all enjoyed the playroom and jacuzzi and there was plenty of room for all of us. The fireplaces kept us warm and the kitchen has everything we needed. Great location for visiting Helen town and exploring some of the Appalachian Trail. The owners communication was great and we couldn't be happier. Thank you so much for letting us enjoy your home. Red Star Lodge was amazing! Our entire family, 8 adults, 2 children and a golden retriever enjoyed Thanksgiving 2018 in the mountains. The house was more beautiful than the pictures. It was clean, spacious and had everything we needed to prepare our Thanksgiving feast. We had some trouble starting one of the fireplaces but the owners were very quick to respond and answered all our questions. We enjoyed the beautiful views and spent hours playing the board games provided. We would recommend Clyde’s Tavern in Cleveland, Ga. for lunch or dinner. The food and atmosphere was great! Looking forward to making this an annual event. Thank you Linda and Keith for the wonderful memories at Red Star Lodge. Perfect cabin for our two families and dogs. Absolutely gorgeous cabin with great views, two floors with beds & baths, also a nice loft with a bed & bath and a game room downstairs that the kids loved!! Only 10 minutes from Helen Ga which is a nice town (decorated for Christmas Now) with plenty to see and do. Fifteen minutes away is Ruby Falls. Definitely worth the walk to see the falls & take photos.During down time we sat on one of three balconies to read or just relaxed in the hot tub! Would definitely recommend & hope to come back soon!! 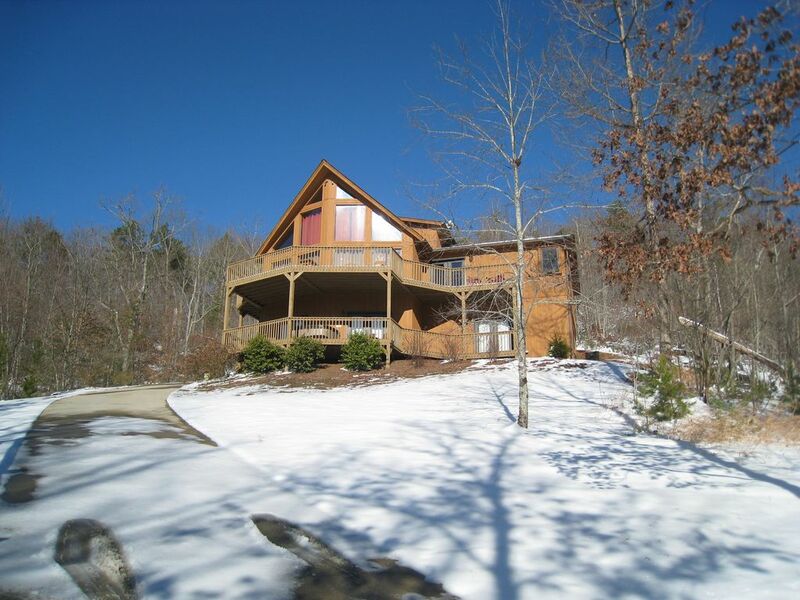 Christine M.
The lodge is picturesque and the view from the great room and deck is fantastic. The bedrooms are large and comfortable. Great kitchen! It is remote and drive to Helen or Clarksville is several minutes. While you are there, however, it is great. It feels like a cabin in a castle. Peacful and Royal and luxury. Full privacy for a large family.Full comfort...for YOU family kids and dogs. Very elegant tasteful decoreted spacious amazing cabin. We enjoyed a wonderful four night stay in this mountain lodge. Our children loved the ping pong table, jacuzzi, games and fire pit. Our golden doodle enjoyed her vacation with us. My husband and I loved all the comforts of home; great kitchens, grill, WiFi and great bed. We also loved the beautiful view. We would definitely stay here again. The Red Star Lodge is centrally located to all that the Northeast Georgia mountains have to offer. Within 10 minutes or less you will find the towns of Helen (8 miles), Sautee (3 miles) and Clarkesville (9 miles) and Unicoi State Park (8 miles). You may find so much to do here that you may not travel any further. But within 20 minutes you will find the towns of Cleveland (12 miles) and Cornelia (15 miles) and the Lake Burton area (12 miles). Again activities are numerous, but maybe on your fourth or fifth day you are ready to explore more . Within about 30 minutes you will find the towns of Clayton (30 miles) and Hiawassee (30 miles) and Tallulah Gorge (25 miles) and Moccasin Creek (20 miles) State Parks. Or you may find a rocker on the main level deck or the hot tub on the lower deck to be the perfect location for you, so be sure to save time maybe on days six or seven to just relax.